There’s something about PixelJunk games that distils the absolute best mechanics of a genre down to a seemingly simple experience. It’s a pattern and an ethos that Q-Games have followed for each of the series – take a base mechanic, stretch it to the best of its ability without straying too far from it, build a game around the abilities that are produced and release it, all within the span of an extremely short development cycle. There’s also something about PixelJunk games which embodies some of the most frustrating gaming experiences possible. Because the games are so tightly constructed, there is often a very fine line between complete success and total failure, and it’s a line that all the Pixeljunk games dance on. PixelJunk Shooter exemplifies these opposites in a game that forces the perfectionist in you to strive for just one more run at the level, and the designer in you to cry out in frustration at some of the choices that were made. It’s not that Shooter is badly-made, it just doesn’t seem polished enough. The base mechanic is, as always, sound, a seamless blend of the dual-stick controls present in games like Geometry Wars and a gravity-based approach that hearkens back to Thrust. There are several manoeuvres that your ship can perform, but rather unfortunately some are never explained, and all fast become necessary to proceed. It’s indicative of a slight lack of finesse in PixelJunk Shooter – while the game is quick to detect when a player is stuck and provide hints, these can be insufficient more often than not and can require a little too much experimentation on the player’s part to proceed. As the game progresses, and the player slowly figures out more and more of the abilities at their disposal, PixelJunk Shooter opens up to quite a sophisticated and crafted experience. Once comfortable with the suite of abilities available, attention can be focused more on each individual level, which operates like very much like a self-contained puzzle. The elements work almost exactly as you’d expect – cooled lava becomes rock, melted ice leaves water behind, and so forth. With these very limited set of tools, it becomes a challenge to use each of them to not only progress through the level but also to save your allies trapped within – kill too many of them by any means and the level has to be repeated. Soon, the caves start requiring much more pre-planning and less obvious a path to success, meting out reward very satisfactorily. It’s unfortunate, then, that as soon as Shooter begins to pick up steam that it throws up a roadblock. At the end of each cave is a large boss fight, which while in itself is a rather welcome break from the standard game, requires a certain amount of gems found in earlier levels to unlock – and they’re easy to miss. The hunt through each of the previous levels for just a few extra gems can be very tedious, and takes a lot of the momentum out before allowing the player to re-engage in the experience. 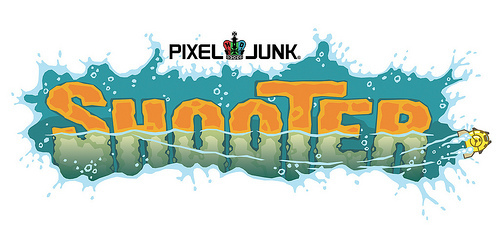 PixelJunk Shooter’s biggest problem, though, is that it’s over before it gets a chance to begin. By the time the player has become fully comfortable with everything it has to offer, it’s already reaching its crescendo. While it might be the most accessible of the PixelJunk games to date, there’s also not enough of it to access, and ultimately leaves the player wanting more bang for their buck. It’s a missed opportunity more than anything else – while there’s obviously a very sound game underneath, it’s wrapped in a shroud of awkwardness and lacklustre signposting. For anyone willing to work at it, the rewards are there, but they’re buried very well.